"Online auction giant eBay has embraced iOS with a variety of apps for the iPhone, iPod touch and iPad, leaving the Mac a browser-only experience -- until now. On Tuesday, the company introduced a free Mac App Store entry in an effort to make the shopping experience as browser-free as possible." Not sure about you, but I really do like Mac applications. 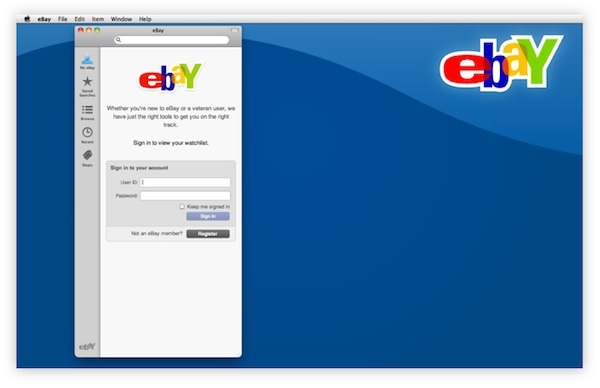 Now eBay has finally come on board the Mac App Store train after being pretty proactive with iOS applications. The app, which is free, will let you browse auctions, bid on items, buy items, etc. Pretty much anything you did from your browser you can do from the app. Well, except for selling. You can't sell items using the app, at least for now.